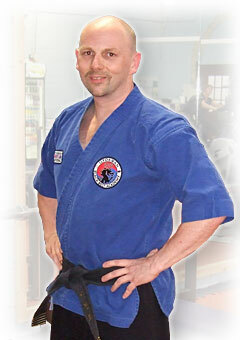 Richard Olpin has been actively training in the Martial Arts since 1983 and has been teaching for over 25 years now. He holds a sixth degree black-belt in Taekwondo (the Korean version of Karate), with extensive experience in a number of other martial arts too. For more than ten years Richard was a member of one of the countries largest traditional Taekwondo associations where he set an unbreakable record by achieving perfect ‘A’ grade passes in every one of his grading examinations up to Black Belt. He first opened his own Taekwondo school in 1995 which then further expanded in 2001 when he set out to broaden the scope of his teaching beyond the constraints of a purely Taekwondo based association. Shortly after this Richard left his day job as a Software Engineer to concentrate full time on teaching. Since deciding to teach full time, he has trained extensively with expert instructors all over the world, in both the traditional martial arts, and from the world of specialised security and military combat instructors. In 2001 Mr Olpin was awarded the title of ‘Master’ and in June 2003 he was promoted to the rank of 5th Degree Black Belt. In June 2004 Master Olpin was honoured with an induction into the Worldwide Martial Arts Hall of Fame in the category “Master Instructor of the Year“. In November of the same year he received an award from the British National Martial Arts Association for his contribution to Martial Arts in the UK. In 2009 Master Olpin was further honoured with an instructors award from Black Belt International for his contribution to the development of martial arts in the UK. In November 2013, Master Olpin was awarded the GIMA ‘Instructor of the Year‘ award, and also promotion to 6th degree black belt. In 2015 he was honoured with an induction to the Martial Arts Illustrated Magazine Hall of Fame, receiving a Gold Award at a special awards presentation in Staffordshire, and as a result was invited to nominate three of his top students who also received recognition at the National Student Awards in July of this year. In addition to his teaching at the Academy, Master Olpin is available throughout the United Kingdom and internationally for specialist courses, seminars, speaking engagements and consultancy. He has a great way of teaching to help everything memorable and has brought a whole new outlook on the way I see life. A firm believer that quality knowledge is based on practical experience, Richard passes on this knowledge both at the school, and to students on specialist courses and seminars. Richard runs his own company ICT Protection Training, which was set up to provide training in all aspects of personal protection to both individuals and specialised groups such as door staff, security teams and bodyguards. With his highly motivated and dynamic approach to personal development, Richard also provides personal development and life skills coaching both to individuals and groups of all sizes. Specialised self-protection courses in schools including both practical self defence, ‘stranger danger’ workshops, anti-bullying etc. Worked with the Avon and Somerset Police to provide self defence courses for the “Youthwatch” programme in South Gloucestershire. Provided specialist training courses for Gloucestershire local education authority Pupil Referral Unit, working with children who are outside the regular school system due to behavioural and emotional problems. Worked with Tiger Aspect television as a martial arts advisor for a television show for Channel 5. Selected by Jetix Television (Part of Disney) to host a special “Channelling your Energy for Good” event . One of our students was selected as the winner! Regular contributor to charity fundraising events, including school visits for LEPRA and organised/hosted annual events for charities including: Cotswold Care Hospice, Make-a-Wish, Macmillan Cancer Support and the Gemini Trust. Featured instructor at SENI, the worlds largest Martial Arts show at the NEC Birmingham.